PRESQUE ISLE, Maine — A new veterinarian starts working at Presque Isle Animal Hospital this month. This April, Dr. Brittney Riley joins the team at the facility owned by brother and sister veterinarians Hanna Cook and Jonah Babiarz. Riley grew up in Lincoln, Nebraska, where she most recently worked as the lead veterinarian on emergency and exotic animal medicine at a clinic, as well as a zookeeper at Lincoln Children’s Zoo. She said she came to Presque Isle after a search for a hospitable landscape. “My husband and I were looking for a place that’s not too warm and has some snow for outdoors activities. My snowshoes haven’t had much use in Nebraska. We were looking for trees, mountains, hills, water,” Riley said. Riley specializes in exotic animals such as birds and reptiles, in addition to working with cats, dogs and other common pets. 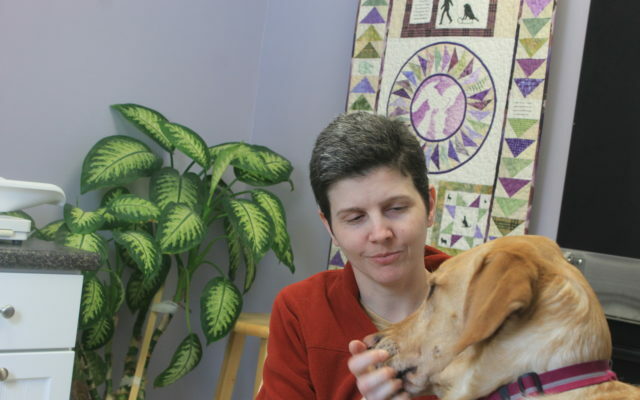 Riley is also the owner of a service dog, Dakota, who serves as a glucose and seizure alert dog. Dakota will smell a saliva sample on a cotton ball, “she’ll check my glucose level and alert me if I’m low,” Riley said. Dustin Cook, the husband of hospital owner Hanna Cook and the practice manager for the business, said their veterinary practice is busy and was in need of another vet and specialist.